Maui is a beautiful bright pinky coral with a hint of red. It is very similar to MAC's Costa Chic in colour. I think it will be perfect for summer. The packaging is very similar to Barry M glosses, but a little heavier and sturdier. The gloss itself smells very sweet - similar to sticky toffee pudding, which is delicious! 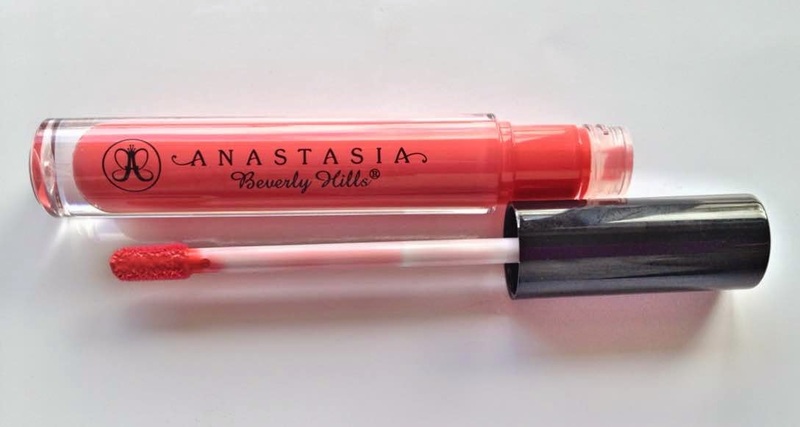 This gloss is extremely pigmented, literally one swipe is all it takes to completely cover the lips. It isn't sticky at all, but is extremely glossy and shiny. It looks very luxurious on the lips and is very comfortable to wear. 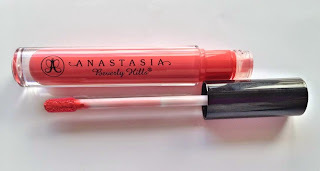 It doesn't stick to my hair (big bonus) and unlike a lot of glosses, the colour lasts a few hours on the lips before I need to re-apply and it makes my lips look very plump. It is thicker in consistency than YSL or MAC glosses, but not gloopy. 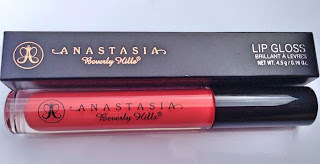 I think it might actually be one of the best lip glosses I have ever tried - bold statement because I was always a gloss wearer until the last 18 months! Dainty & Undressed - I'm coming to get you! I would love to hear what your favourite lip gloss brand is? Are you tempted by these Anastasia glosses?